It may get bad press for being the "Sloaney Pony" but there's no doubting that The White Horse is one of London's best pubs. Located on the corner of Parson's Green a stone's throw from the tube, this special establishment used to be one of the last staging posts on the route out of London. The well-stocked bar has won awards for its excellent array of beers, ales and lagers (and now wines) while the food keeps on getting better and better (but, we hasten to add, dearer and dearer). The best thing about the gastro menu is the pairing-off between dishes and their ideal beverage partner, such as combining certain sweet puddings with rare chocolate beers. Besides the fact that it's widely considered as the best beer pub in Britain, that its food is delicious and that it boasts a fine Victorian interior that makes you feel like part of a period drama, the real selling point of The White Horse is its large beer garden, which backs on the green and is packed every evening and throughout summer weekends. There are enough tables to ensure that, if you hover long enough, you'll be rewarded at some point with a perch - but as its set back from the pavement, drinkers can gather as they will, pint in hand, and chatter away about polo, hunting, the latest in Barbour fashion - you name it. Depending on the weather, a huge barbeque grills sausages, burgers and steak for the ravenous, wafting its ambrosial aroma around the whole of this delightful corner of SW6. Despite its reputation as a Sloane hangout, the clientele is often quite eclectic - from 18-year-old students in mufty to 80-year-old pensioners in tweed, from football-shirted Fulham or Chelsea fans to your fair share of Hooray Henrys in their whites and on the way for a spot of tennis at the Hurlingham. The best pubs near London The White Horse. The White Horse clubs, bars, cabaret nights, casinos and interesting nightlife. 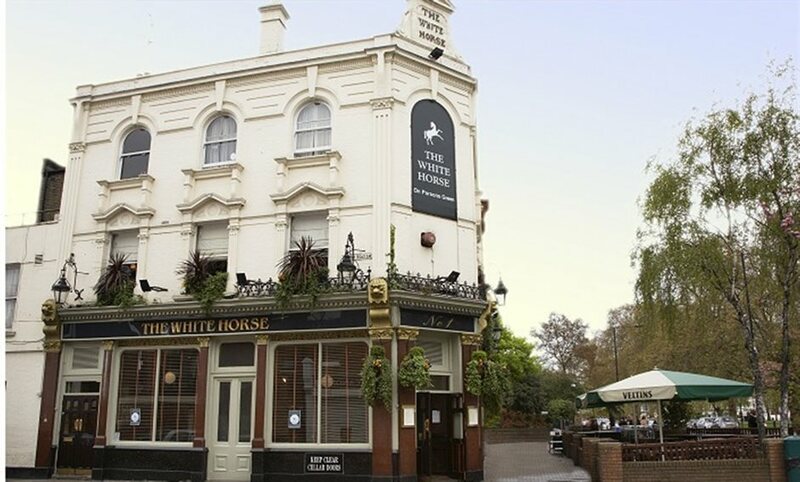 What are the best dining options near The White Horse London? The White Horse gyms, sporting activities, health & beauty and fitness. Where to have your meeting, conference, exhibition, private dining or training course near The White Horse. From cheap budget hotels to luxury 5 star hotels see our special offers for The White Horse hotels, including Holiday Inn Express London Earls Court from 79% off.